Some police officers in Northern Ireland opposed to power sharing and the Good Friday Agreement are intent on undermining the process, Sinn Fein President Gerry Adams said today. As Sinn Fein Assembly member Francie Brolly continued to be questioned by detectives investigating an IRA triple car bomb attack in Claudy, Co Derry in 1972, Mr Adams claimed political policing was being allowed to go unchecked in Northern Ireland. He also said the remaining challenge for the British Government was to make policing more accountable by transferring policing and justice powers from Westminster to a new devolved administration at Stormont. In November 2001, the Royal Ulster Constabulary, which was 93% Protestant, became the Police Service of Northern Ireland (PSNI) following the implementation of some recommendations proposed by the Patten commission on police reform. In a bid to increase Catholic and nationalist numbers, half of all PSNI recruits are drawn from the Catholic community while hundreds of RUC officers also left the force under a very generous severance package. With police accountability regarded a key issue for nationalists, Northern Ireland Chief Constable Sir Hugh Orde and his officers are answerable to a Policing Board made up of locally elected politicians and independent members and to local district policing partnerships. Complaints against the police are also investigated by the Police Ombudsman Nuala O`Loan`s investigative team. The nationalist SDLP, Irish government and Catholic bishops have backed the reforms and the Irish sporting organisation, the Gaelic Athletic Association lifted a ban on police officers playing Gaelic football and hurling. However, Sinn Fein has withheld its support, pointing out that key Patten Report recommendations have not been implemented. Mr Adams today accused the SDLP of jumping too soon to endorse policing and said the party was to blame for political policing. “In four years on the Policing Board, they have failed to hold the political detectives publicly to account and failed to end collusion and political policing,” he said. The Sinn Fein leader said his party wanted to ensure there would be no safe haven for politically-motivated policing in the future. The Irish Government must press ahead with granting presidential pardons to paramilitary fugitives, Irish premier Bertie Ahern said today. The mechanism to grant amnesties to the so called on-the-runs (OTRs) has been criticised by Opposition parties as being constitutionally dubious and hurtful to victims of unsolved crimes. But Mr Ahern said the issue of pardons for OTRs had been in the pipeline since 2001 and had to be resolved to continue momentum in the North’s peace process. Speaking after meeting British Prime Minister Tony Blair at the EU Mediterranean summit in Barcelona, Mr Ahern said the British government was very determined to pass controversial legislation on the issue and he would also press ahead. Mr Ahern said that only a handful of people were likely to qualify for pardons under the Irish mechanism to deal with the issue. “This is business that has to be completed,” he said. Under the Government’s plans, an Eligibility Board will receive and vet applications before passing them onto the Justice Department for consideration. The Cabinet will then study candidates before finally referring them to President McAleese to grant the pardons. Mr Ahern said the OTRs issue was negotiated under the Weston Park Agreement and Joint Declaration and refused to accept comments by Fine Gael leader Enda Kenny that the mechanism was inappropriate, constitutionally dubious and hurtful to victims. “This was an upfront agreement in 2001 to deal with what arose out of the 1998 position. The legal basis used was based on the Attorney General’s advice. This is an issue that has to be dealt with and completed. We allowed out all of the prisoners in 1998 so we’re now talking about people who were never caught and probably a lot of them would never return home. To get completion, these particular cases have to be dealt with,” he said. The SDLP has walked out of the monthly meeting of Derry City Council accusing Sinn Féin of making remarks that could endanger their members. They said today they will not be back in the council chamber until the remarks are withdrawn. Pat Ramsay, SDLP leader on the council, said the allegations made by Sinn Féin’s Kevin Campbell against the SDLP team “have no substance or foundation, but they could put the councillors’ homes and families at risk of attack”. He said the comments made had broken an unwritten agreement that comments of a personal nature should not be made during debates in the council. Sinn Féin said the SDLP had been the first to break the agreement and Cllr Campbell would not be withdrawing his remarks. A former trade unionist from England has been appointed as the new chairman of the Parades Commission. Roger Poole is expected to be named on Thursday, along with six other new commissioners for the marching body. David Burrows, the once prominent Portadown Orangeman, has also been named in the new line up, which also includes three women. Mr Poole had a prominent role as a chief negotiator of the national ambulance strike of 1989 to 1990. He was also a key player in the merger of trade unions NUPE and COSI which formed Unison. It is understood Mr Poole, who served as assistant general secretary of Unison, is already in Belfast preparing for his new role. Donald MacKay, who in the past stood as an Ulster Unionist for Craigavon Borough Council, has also been appointed, as has former SDLP MP Joe Hendron. There was not a single woman on the outgoing Parades Commission, however, Ann Monaghan, who once stood for the Women’s Coalition, Vilma Patterson and Alison Scott-McKinley have been appointed to the body. All of the new appointments will take up their posts in January. Northern Ireland Secretary Peter Hain has challenged the new commisioners to “make contentious parades a thing of the past”. “I am appointing this commission with a mandate to work itself out of a job by helping to create an environment in which accommodations on parades can be made between the two communities without the need for formal determinations,” he said. 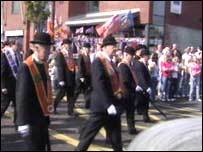 The Parades Commission was set up in 1997 to make decisions on whether or not restrictions should be imposed on controversial parades during Northern Ireland’s marching season. The arrest of Northern Bank employee Chris Ward in connection with last December’s robbery at its Belfast headquarters has been described as “politically motivated” by his solicitor. The 24-year-old and a female bank employee were arrested yesterday following dawn raids by the PSNI in the Poleglass area of west Belfast. After the heist, Mr Ward appeared on television and described how he had been taken hostage in the run-up to the raid. He explained in detail how he and a colleague had been forced to facilitate the theft of £26.5 million (€38.7 million) from the bank’s city centre base. In a statement released to Daily Ireland yesterday, solicitor Kevin Winters insisted that his client’s arrest was politically motivated and without basis. Mr Winters said: “Mr Ward was a victim in this matter. At all times, he has been co-operative with all police and other inquiries. Mr Winters said his client had been the subject of some adverse media commentary a short time after the robbery. The lawyer added: “As a result of prejudicial and suggestive media commentary, Mr Ward took the decision to provide an interview with the BBC in order to set the record straight. “That interview had the desired effect because it completely nullified any continued prejudicial media commentary. “In turn, that decision by him has now been used by police to undermine him. “Police are now referring to this media interview and are attempting to use it as some sort of evidential or other basis to question his credibility. “It is extremely unfair for police to take this interview and attempt to compare it with other interviews he gave to police about his ordeal. Earlier this month, three men were charged in connection with the Northern Bank robbery. All of the suspects said they were innocent. A small amount of cash recovered at a PSNI sports club in Belfast is believed to have come from the robbery. With the bulk of stolen cash missing, most of it in Northern Bank notes, the bank was forced to issue redesigned currency and withdraw the earlier issue in a bid to make the robbers’ haul worthless. Sinn Féin president Gerry Adams, speaking about the arrests, said: “People should not be subjected to trial by media. The Apprentice Boys have rejected calls to postpone a series of weekend parades as a mark of respect for George Best. The Irish soccer legend will be buried on Saturday, at the same time as 16 Apprentice Boys’ marches are scheduled to take place throughout the North. Nationalist residents’ groups which had planned to protest along some of the routes used by the Apprentice Boys have cancelled their demonstrations as a mark of respect. However, Apprentice Boys’ leaders have refused to bend on the issue and insisted their parades will go ahead. Even a last minute plea from a former Ulster Unionist Lord Mayor of Belfast last night has failed to change their minds. Leading Orangeman Jim Rodgers called on the Apprentice Boys and Parades Commission to work together to set a new date for their Lundy Day march. His call came after the Ardoyne Parades Dialogue Group in north Belfast confirmed they were cancelling a protest they had planned for Saturday. Despite this the Apprentice Boys remain adamant that their parades will go ahead as planned. Leading member William Hay said moving the date would cause difficulty and confusion. “The main Londonderry parade was supposed to take place on December 18, but we moved it back to December 5 at the request of traders,” he said. The majority of the 16 Apprentice Boys’ parades planned for Saturday will take place in Belfast. After each march, members will board buses and travel to Derry for the main Lundy Day demonstration. Mr Rodgers, a long time friend of George Best, believes the conditions exist to reschedule the parades for another date. Nationalist resident groups said their decision to cancel parade protests was an indication to of their willingness to resolve the marching issue through dialogue. “We hope that the loyal orders acknowledge and recognise this,” said spokesman Joe Marley. A crowd of up to 500,000 is expected to gather at Stormont buildings for Geroge Best’s funeral. Leading unionist politicans including Democratic Unionist Party MPs Peter Robinson and Gregory Campbell have said they will attend. With the large numbers expected health and safety chiefs have ordered crowd restrictions. Only 30,000 mourners are to be allowed into the Stormont estate. “This is a serious issue. We can’t cope with massive numbers,” said a spokesman. A Sinn Féin assembly member was among four people still being questioned by the PSNI last night in connection with a 1972 bombing in which nine people were killed. Sinn Féin said the arrest of Francie Brolly as part of the investigation into the Claudy bombing was politically motivated. The 60-year-old East Derry assembly member was arrested in Dungiven, Co Derry, with another man during a PSNI swoop yesterday morning. A 50-year-old man and a 58-year-old woman were also arrested in Portglenone in Co Antrim and Dungannon in Co Tyrone. Three car bombs exploded in Claudy on July 31, 1972. Nine people were killed, including a nine-year-old girl. Around 50 Sinn Féin protesters gathered at Dungiven PSNI station yesterday afternoon to demand the release of the four. The protest was led by Sinn Féin general secretary Mitchel McLaughlin, who described Mr Brolly as “a highly respected representative”. Mr McLaughlin told protesters that he suspected the involvement of Special Branch in the operation. Mr Brolly’s wife Anne, a Sinn Féin councillor and former mayor of Limavady, has publicly backed calls for a judicial inquiry into the Claudy bombing. “I felt what happened in Claudy was a grievous wrong,” Mrs Brolly said in 2003. Mr Brolly and the three other people arrested were being held under section 41 of the Terrorism Act 2000. They can be held for questioning for two days. In September 2002, the PSNI said it was reviewing the Claudy case after alleging the involvement of the Co Derry priest James Chesney in “terrorism” in the area. The priest died in 1980. The Catholic Church disputed the claims, which arose from an anonymous letter allegedly sent by a priest in England to a newspaper. The letter claimed that Fr Chesney had informally confessed his involvement in the bombing to the letter writer. The Derry diocese questioned the authenticity of the letter. The PSNI alleged a cover-up had been hatched between the British government and the then Catholic primate Cardinal William Conway to keep Fr Chesney’s involvement secret when rumours began to circulate that he was linked to the bombing. Cardinal Conway moved the priest across the Border to Malin Head in Co Donegal, where he died eight years later. Sinn Féin chief negotiator Martin McGuinness last night demanded the release of Mr Brolly and called into question the motives of the PSNI. The Mid-Ulster MP said: “This morning, heavily armed PSNI members arrested East Derry assembly member Francie Brolly from his home in Dungiven. “This is the latest and among the most blatant examples of political policing seen here in recent times. “As has become the norm with this type of political policing, selected media outlets were briefed about the identities of those arrested,” he said. Mr McGuinness described Mr Brolly as a key player in the peace process. “His arrest is completely motivated by an anti-peace process and anti-Sinn Féin agenda operating at the heart of the Special Branch,” said the former Stormont education minister. Francie and Anne Brolly are well known in Irish traditional music circles and have recorded a number of albums. Mr Brolly also wrote the republican favourite The H-Block Song, which pays tribute to IRA prisoners who took part in blanket protests in the Maze prison during the Troubles. Democratic Unionist Party assembly member Ian Paisley Jr said yesterday that anyone found guilty of the Claudy bombing should not be included in any amnesty for outstanding paramilitary crimes under on-the-run legislation, due for process through the British parliament. Wayne O’Donoghue arriving at Central Criminal Court in Cork yesterday where he admitted killing, but not murdering, 11 year-old Robert Holohan. A STUDENT yesterday admitted killing schoolboy Robert Holohan. Wayne O’Donoghue (21) took to the stand during a dramatic opening day of the trial into the murder of his young neighbour in Midleton, Co Cork, on January 4. His parents sat side by side in the public gallery as he pleaded guilty to the manslaughter of the 11-year-old. He claimed he did not mean to kill the boy. “Not guilty to murder – guilty to manslaughter,” he told Mr Justice Paul Carney. The court also heard the defendant put Robert’s lifeless body into the boot of his car and drove it to an isolated area. SIPTU has accused employers in the construction sector of engaging in similar activities to those that have caused huge controversy at Irish Ferries. The trade union movement is refusing to engage in the partnership process as a result of Irish Ferries’ move to replace its existing workers with cheaper labour from eastern Europe. The Irish Congress of Trade Unions says this is part of a “race to the bottom” in the jobs market, with pay and conditions being eroded in the name of competitiveness. SIPTU says this is most obvious in the construction sector, with agency workers and sub-contractors being used by some employers to “displace” existing staff. The union also claims non-national workers in the building trade are being falsely categorised as self-employed so bosses can ignore agreed pay and conditions. SIPTU spokesman Eric Fleming said the Government and employers needed to stamp out such activities or construction workers would be forced to take industrial action to protect their jobs. The PSNI has defended the arrest of a Sinn Féin Assemblyman in connection with an IRA bomb attack in the Co Derry village of Claudy more than 33 years ago. Francie Brolly was among four people arrested yesterday in connection with the detonation of three no-warning car bombs in the village in July 1972. Sinn Féin has accused the PSNI of carrying out the arrest for political reasons and has also accused the police of leaking Mr Brolly’s name to the media. However, assistant chief constable Sam Kinkaid insisted last night that the arrest resulted from a new line of inquiry being pursued since the Claudy investigation was re-opened three years ago. He also denied that the PSNI had told journalists Mr Brolly was among yesterday’s detainees.